The range of Power Team wrenches and pry bars available here at SGS Engineering includes everything from a ratcheting chain wrench to all sorts of jimmy bars. Whether you’re after heavy duty equipment such as a hook spanner or chain pipe wrench that is capable of servicing industrial tractors, or require something suited to smaller jobs, like a 9.5mm pry bar or just a gland nut, all these options and more are available. Look through the listings below to discover a chain wrench, pry bar or other hydraulic tool that will meet your needs. 209199 Replacement chain with pin for No. 7400 chain wrench (406 mm long). 209200 Replacement chain with pin for No. 7401 chain wrench (610 mm long). 885 Adjustable hook spanner wrench. Needed wherever turret adjusting nuts or packing gland nuts are used. Cap. : 38 to 102 mm. Handle overall length: 483 mm. 7307 Replace many fixed-size wrenches. Cover range of capacities needed to service industrial tractors and other equipment. Drop-forged jaws adjust to eleven positions for a capacity of 121 to 324 mm O.D. Handle overall length: 610 mm; diameter: 25.4 mm. Spanner wrench with one 9.5 mm thick jaw. 7308 Spanner wrench with two interchangeable jaws: one 9.5 mm thick, one 19 mm thick. 1266 Adjustable gland nut wrench. Designed to handle 51 to 152 mm dia. hydraulic cylinder gland nuts on many construction vehicles. Fits 6.4 and 7.9 mm dia. pin holes; features a 3/4" sq. drive. 7162 Our rolling head pry bars are an extremely popular and useful tool. Head may be used for almost any prying job since a great deal of leverage can be obtained. Long tapered body may be used as a lining-up drift. 9.5 mm round, 152 mm long. 7163 Pry bar; 11.1 mm round, 305 mm long. 7164 Pry bar; 14.3 mm round, 406 mm long. 7165 Pry bar; 19 mm round, 457 mm long. 7166 Jimmy bar ideal for general lifting or prying. Heat treated chrome alloy steel to resist bending or breaking. 15.9 mm round, 457 mm long. 7167 Jimmy bar; 19 mm round, 610mm long. 7168 Jimmy bar; 22.2 mm round, 762 mm long. 7420 Two big jimmy bars for big jobs. Forged from chrome alloy steel. 22.2 mm round, 1168 mm long. 7421 Jimmy bar; 25.4 mm round, 1372 mm long. Here at SGS Engineering we have a great selection of hydraulic tools, Power Team wrenches, Power Team pry bars and more on offer. These products all come from well-respected manufacturer Power Team, and are of the highest quality, making them the first choice for companies all over the world. 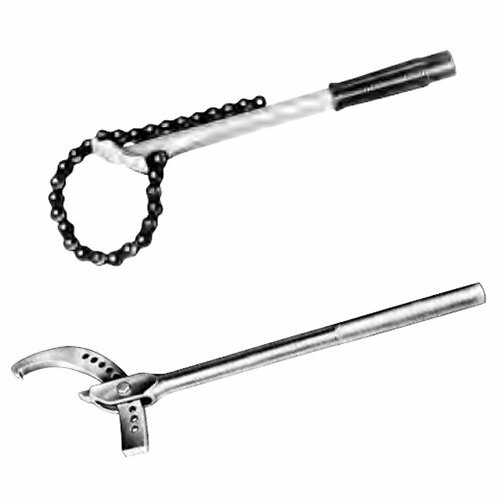 If you need a Power Team pry bar, hook spanner, heavy duty chain wrench or any other such tool, then look no further. Browse the range of pry bars, jimmy bars and other hydraulic tools on this page and find the ideal item for any light or heavy task. Power Team products offer fantastic quality and craftsmanship, and even better than that, a lifetime warranty. This is the level of confidence that Power Team has in its products, so you can rest assured that the adjustable hook spanner, ratcheting chain wrench or gland nut on sale here are some of the best around. To find out more about Power Team wrenches and pry bars get in touch with us today. Call our prices and technical hotline on 01332 576 850 to get quotes and to ask any questions you have about our excellent Power Team products. Get in touch to find your next chain wrench, adjustable hook spanner or pry bar today.